Although the Chrome Web Store offers a large number of browser apps and extensions, the thing that many Android users wish to have is a seamless cross-platform experience in which Android apps also run on computers. So far, only a handful of Android apps can be run on a Chromebook or Chromebox (Chrome OS). That’s quite nice for the (few) people with a Chromebook at home. Windows and Mac users, however, need to be patient and wait. Or do they? Well, maybe for something official, but one developer figured out a way to run Android apps on Chrome for Windows, OS X and Linux. 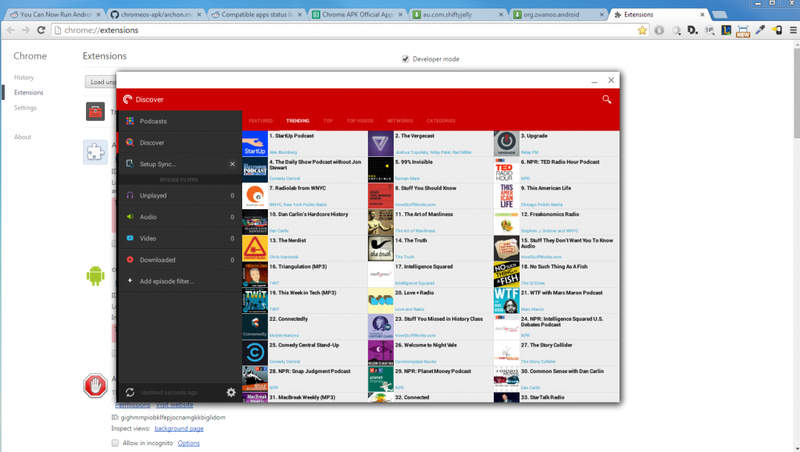 A modified version of Google’s Android Runtime for Chrome, called ARChon, makes it possible. With it, you can even run multiple Android apps at once. Setting everything up and installing your first Android apps on Chrome does take a little bit of work. And on top of it, you need to modify Android apps before you’re able to load them into Chrome. Speaking of apps, note that not all work using this method. Apps that need other components or frameworks, as well as many paid apps won’t work. The Chromeapks subreddit has been building a list of working apps together with download links to already modified app files. So maybe you want check it out before you get started. So how do you get it running? You can find all the instructions on the developer’s GitHub project page. Before you get started, be aware that you must have Chrome 37 or higher installed and that the modified Android Runtime might be unstable on a system that’s not running Chrome OS.